Howell & Saxtan were in business in Brooklyn, N. Y. from approximately 1866 until the early 1890s, and the proprietors were James Howell (1829-1897) and Daniel Y. Saxtan (1824-1904). James Howell was prominent in Brooklyn politics and served two terms as Mayor of Brooklyn. His obituary in the New York Times (28 Jan. 1897, p. 7) reads in part, "Ex-Mayor James Howell of Brooklyn, President of the Trustees of New York and Brooklyn Bridge, who had been ill since last Spring, died yesterday morning at 7:40 o'clock, at his home, 8 South Portland Avenue, Brooklyn. ... Mr. Howell was born at Bradford, Wiltshire, England, Oct. 16, 1829. His parents brought him to this country when he was six years old, and located at New Lisbon, Ohio, where he received his early education. He went to Brooklyn in 1845. He began business as a grocer, but soon gave that up to learn the iron trade. He became foreman in the shop in which he worked, and in 1855 laid the foundation of the great iron firm of Howell & Saxton [sic]. "In 1864 he was elected a Supervisor from the Eleventh Ward, where he resided for many years. He was re-elected and also served in the Board of Aldermen. In 1877 he was elected Mayor by 3,000 majority over John F. Henry, the Republican candidate. In 1879, when he was renominated as a reward for an able administration of the city's affairs, he was elected over Franklin Woodruff by a majority of 12,000. He accepted a third nomination in 1881, but was defeated by Seth Low by a majority of less than 3,000." Another notice, in The Foundry. Detroit, Feb., 1897. Vol. 9, No. 54, page 264, summarized his life in these terms, "James Howell, ex-mayor of Brooklyn and president of the board of trustees of the Brooklyn bridge, died on January 27 after a long illness at his home in Brooklyn, N.Y., at the age of 68 years. Mr. Howell was born in Bradford, England, and came to this country with his parents when he was six years of age, settling on a farm in Ohio. In 1845 his parents removed to Brooklyn, where he shortly entered into an apprenticeship of four years in an iron foundry. At the close of his apprenticeship Mr. Howell was promoted to be foreman in charge of the shop, and in 1855 he started in business for himself. In the course of time he took a partner, and the firm became Howell & Saxtan, employing several hundred men in their iron foundry. The company's foundry has been closed for several years, Mr. Howell having latterly devoted his attention to municipal affairs and to public business generally. He served two terms as mayor of Brooklyn, and in 1893 he was appointed a bridge trustee, which office he held at the time of his death." Howell received a long article in A History of Long Island From its Earliest Settlement to the Present Time, by William S. Pelletreau. Vol. III. The Lewis Publishing Co., New York and Chicago, 1905. This reads in part, "In the death of James Howell, ex-mayor of Brooklyn and late president of the New York and Brooklyn Bridge, which occurred at his late residence, 8 South Portland avenue, in his sixty-eighth year, the borough of Brooklyn, New York, has suffered an almost irreparable loss… James Howell was born in Bradford, Wiltshire, England, October 16, 1829, and when six years of age came to the United States with his parents, who settled in New Lisbon, Ohio, which was then known as the far west. He came to Brooklyn at the age of sixteen years, and his first business experience was gained in a grocery store, where he served as general chore-boy for a short period of time… [He later] became an apprentice in an iron foundry, where after serving his time he continued to work and finally was promoted to the position of foreman. After serving in this capacity until 1855, he determined to engage in business on his own account, and … established an iron foundry in his own name. Out of this small investment has grown the extensive trade conducted for any years under the name of Howell & Saxton [sic], employing several hands…"
Daniel Y. Saxtan was a son of Richard and Rosannah (Young) Saxtan, and was born December 13th, 1824, in Farmingdale, Long Island. He appears in the 1880 U. S. Census, living at 75 Willoughby Ave., Brooklyn. He was 55 years old, and lived with his wife, Phoebe, a daughter, Lilly, and a grandchild. Twenty years later in the 1900 U. S. Census, Saxtan still lived at 75 Willoughby. Now he was 75 years old, and his occupation was "Landlord." He had a new wife, Jennie, married 5 years. His daughter, Lillie, was married to Frank Weilbacher, a ribbon manufacturer, who lived with the family. They had two small children. A one-line listing "Saxtan, Darl [sic] Y., builder, Oct. 22 , [age] 80" appeared in a Local Necrology in the Brooklyn Daily Eagle Almanac, 1905, pg. 602, to mark his death. Henry Reed Stiles, writing in The civil, political, professional and ecclesiastical history and commercial and industrial record of the County of Kings and the City of Brooklyn, N. Y. from 1683 to 1884 (1884), deals extensively with Daniel Y. Saxtan. In part, Stiles says, "Daniel Y. Saxtan is a son of Richard and Rosannah (Young) Saxtan, and was born December 13th, 1824 in Farmingdale, Long Island. In 1825 his parents, with their family, removed to Brooklyn, where he was educated in the public schools, as boys of his time were educated; and at the age of fourteen he was apprenticed to learn the trade of blacksmith with Rev. Timothy C. Young, who had a shop at the foot of Pearl street. After acquiring the trade, he was, for several years, a journeyman blacksmith. About 1851 he formed a partnership with Jacob Outwater for the manufacture of iron railings, and their works were located in Adams street, near Myrtle avenue. "In 1866 the firm of Howell & Saxtan was formed, the partners being ex-Mayor James Howell and Daniel Y. Saxtan, and these gentlemen established the Central Iron Works, at the corner of Hudson and Park avenues, with offices in Adams street. This firm is celebrated for the manufacture of all kinds of architectural iron work, making specialties of fronts, roofs, bridges, domes, capitals, arches, railings, stoops, door and window guards, lamp and awning posts, sky and area lights, rolling and folding shutters, and many other kinds of iron work similar in character. The reputation of this concern for fine and reliable work is well established, and the proprietors have a reputation second to no other firm in the city. As wire-workers, they may be considered as among those in the foremost rank, and as evidence of their facilities and ability to cope with any undertaking they assume, we may mention a few of the most prominent of the many structures for which they have erected or furnished the iron parts: The retort houses of Havemeyer & Co., in Williamsburgh; the Hanover buildings and the Wheeler buildings (now owned by Wechsler & Abrahams), in Fulton avenue; the new Municipal Building of the city of Brooklyn, the armories of the 13th, 14th and 23d Regiments, and of that of the 47th Regiment, now in course of construction; and ex-Mayor Schroeder's building, and the Young Men's Christian Association building, in Fulton avenue." 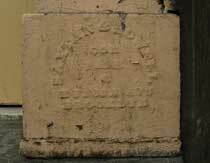 In 1866 IRS taxed Saxtan & Howell, "cor Hudson & Park Aves," $188.46 for 52 tons and 700 pounds of Iron Castings. The rate was $3.60 per ton. The 1870 U. S. Census (non-population schedules) recorded James Howell iron railings as owning $20,000 in real capital and $108,100 in raw materials consisting of coal 8 tons $50, steel 500 pounds $50, cast [iron] 400 tons $36,000, iron 200 tons $18,000, and wrought iron 57,000 tons $54,000. The average number of workers in the previous year was 50, with total annual wages for labor $36,725. The value of goods produced in the year, consisting of 104,644 feet of iron railings of all kinds, was $156,967. Also, prior to his partnership with Saxtan, James J. Howell was in business with Charles Tipling and George Stevenson as Howell, Tipling & Co. This business began around 1856 and was located at 289 Adams St. Howell, Tipling was also known as Howell & Tipling, and they were listed in the Lain's Brooklyn City Directory from 1856 to 1862. Howell then carried on the business on his own, and continued at 289-291 Adams St. until 1866 when Saxtan & Howell was formed. This ad for Howell, Tipling, & Co. appeared in Smith's Brooklyn Directory of 1856. This ad for Howell & Tipling appeared a year later, 1857. George Stevenson is no longer mentioned as a partner. This ad from Lain, 1862 assigns the name Central Iron Works to the Howell & Tipling foundry. This ad for James Howell, Jr. (late Howell & Tipling) shows Howell on his own in 1864. These ads present the companies primarily as manufacturers of iron railings. The architectural iron of a later date had not yet become one of their products. Howell & Saxtan were also known as the Central Iron Works. They had offices at 353 Adams St., and their foundry was located at the corner of Park Ave. and Hudson Ave., Brooklyn. This ad appeared in the Brooklyn Daily Eagle Almanac of 1892. They were located at 353 Adams St. from approximately 1874 until they closed in the early 1890s. In Dec., 1892, an ad in the Pratt Institute Monthly cited Carrère & Haas Iron Works as "Successors to Howell & Saxtan." Their Brooklyn office was "Nos. 351 and 353 Adams Street," and their foundries / works were "Park and Hudson Ave., 331, 333, 351 and 353 Adams St., Brooklyn, N. Y." In 1899 the New York Times (17 Dec. 1899, p. 16) reported that the Saxtan & Howell properties had passed into the hands of the "Eagle Iron Works, Jacob May, president." 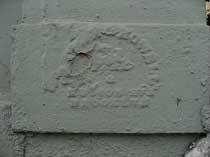 Other Howell & Saxtan foundry marks are found at 891 Grand St., Brooklyn, and 1377 Bedford Ave., Brooklyn. 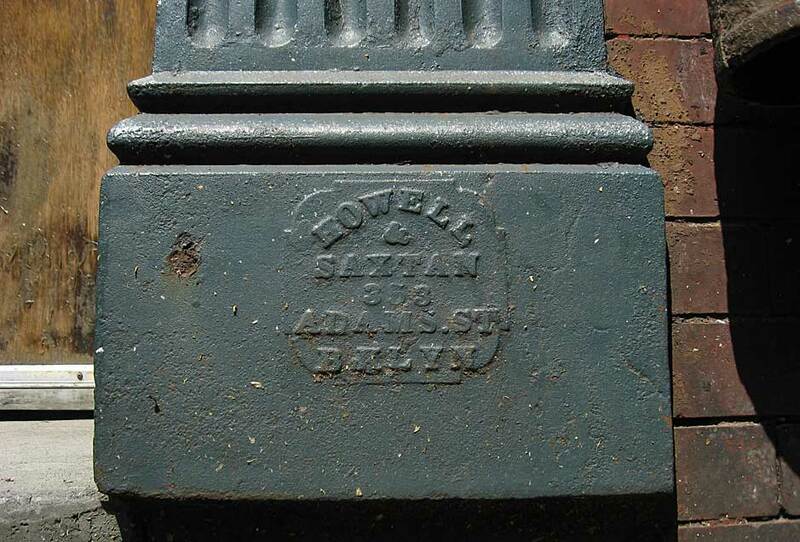 An interesting juxtaposition occurs on adjacent buildings on DeKalb Ave., Brooklyn, where Howell & Saxtan is found at 237 DeKalb Ave. and Saxtan & Howell is found at 239 DeKalb Ave.
Howell & Saxtan also manufactured coal chute covers. Examples of these are found on their "manholes" page.